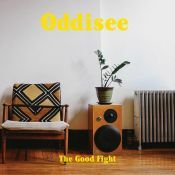 An old soul, an odd soul, Oddisee (rapper and producer) is an anomaly in the 2015 scene. Thoughtful lyricism, this is a man on a inner soul mission to grow, to blossom, to become greater. We travel with him on this journey. While there is a few fillers it's an impressive trip we take with him we slow down enough to soak it in. Shows hope for hip-hop future. If "The Good Fight" where released earlier, like say in the 90's, it might have been something to talk about. With a few great tracks, it's sad it's drowning in mediocrity.